Car electrical system, how do I jump start my car, alternator, charging system, battery cables. Check the battery terminals and make sure they are tight. Try to turn on the lights for a second then turn them off. This is sometimes enough to reestablish a good connection. Read below for more diagnostic tips. Not sure which connections go where when jump starting a car? Good battery car: Red (+) cable to (+) terminal of battery & Black (-) cable to (-) terminal of battery. Dead battery car: Red (+) cable to (+) terminal of battery & Black (-) cable to metal ground on engine. Read below for the full procedure. How does my cars electrical system work? Learn how the automotive electrical system works in your car. From the Battery, Starter, Alternator and Cables, we will look at how to keep your electrical system operating properly. When it comes to getting your electical system serviced, follow the tips below to make sure your mechanic fixes it right the first time. The battery is usually the first part of the system to wear out. Most batteries last between 3 and 7 years depending on brand and design. Batteries can be fine on minute, and dead the next. More on this later. Blown fuse: Is one part of the electrical system not working like the interior lights or dash lights? Your first thing to check is the fuses. Look for the fuse panel under the dash, in the glove box, or even in the engine compartment in some cars. Most fuse boxes will be labeled by circuit. Modern cars use a blade type fuse which is rectangular in shape and transparent. Look for the wire which runs through the fuse and see if it is burned through. Any discoloring of the fuse is a good sign the fuse has blown. If you have doubts, replace with a new fuse and test the system which is not working. 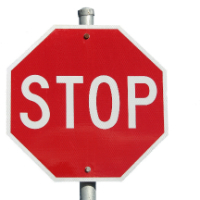 Alternator: Does your car start ok, but your headlights dim when idling. It could be a bad alternator. When the alternator can not produce enough electricity to keep the electrical systems running and the battery will have to be used to take up the slack. This will eventually wear down the battery and not allow your car to start. Car won't start, all I hear is a click but the engine does not turn. First check all battery cables for corrosion as this will keep power from flowing freely to the starting system. If they are dirty, clean with a wire brush and reattach. ( Click Here For an Example of a Battery Brush )Apply a light coat of grease to the top of the terminals to prevent further corrosion. Battery could not have enough power stored in it to spin the engine. This can be caused by a bad cell in the battery or from a bad alternator not charging the battery when the engine is running. If you can get the car to a mechanic, have him or her test the battery and charging system with a special tester. This tester places a load on the battery and can tell the condition. They can also check to see if the alternator is working to it's full potential. Starter or solenoid could be bad. If you can not jump start the car and all of the battery cables are ok then suspect the starter. Car won't start, I hear nothing. Check battery cables as above. Have the battery tested. There could be a bad cell causing a short. You can try jump starting but often the car will not stay running. Car won't start, all I hear is a horrible grinding noise. Grinding noises point to the starter not properly meshing with the flywheel. This can be caused by a bad solenoid or a bad spot on the flywheel. I have also seen starters loosen up so they no longer contact the flywheel at the proper distance. While not common, it is something to keep in mind. Car starts but my headlights are dim at low engine speeds. Look to the alternator for problems. Take the car to your mechanic to have the alternator checked for proper operation. Check for loose wires going to the alternator. Also check for corrosion as this will inhibit the alternator from charging properly. Check the tension on the alternator belt. If it is too loose, the belt may slip and not drive the alternator properly. Replace your battery every 4 years as a safety measure. It will save allot of headaches down the road. 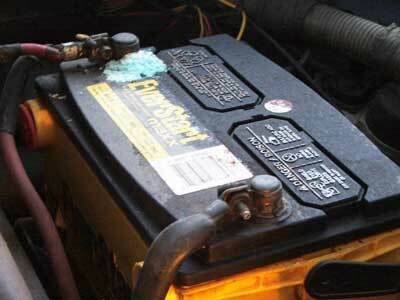 If your battery is not a sealed unit, check fluid levels in each cell. Only fill with distilled water and be careful around the acid which is in the battery. Check your alternator belt frequently for cracks and tension. Replace per your cars manufacturers recommendations. Clean your battery connections at least once a year. Parts stores sell a handy terminal cleaner which is basically a round wire brush which works wonders. Once you reattach the terminals, coat with a layer of heavy grease or special purpose grease sold at parts stores. This layer will block the air from reacting with the connectors and creating corrosion. Jump starting your car does not have to be a hard task. First lay out the cables on the ground between the two cars. 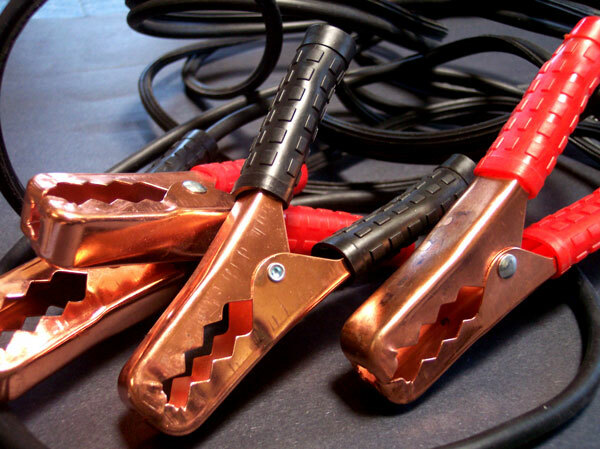 Make sure that the cable is not tangled and none of the end clamps are touching each other. The car with the good battery should be running. That's it...... turn the key on the dead car and the car should start. If it does not, try revving the engine on the good car to boost the charge coming from the alternator. If this does not work, try wiggling the cables to assure you have a good connection. A GOOD set of jumper cables are a necessity. I have had cheaper sets not jump start a dead car. I actually had to double up two cheap sets to get enough current to start my car. The cheaper sets will have thinner cables which can not carry enough amperage to start some stalled cars. I would suggest buying a cable which has 4,6 or 8 gauge wire. Battery Drain or Bad Alternator?